“Rame Océan 2017” is an international rowing race that starts on December 10th, 2017. The goal of the skippers is to cross the Atlantic Ocean, from Dakar to the finish line, located between the Salvation Islands and Kourou. To win the race, is to overcome your own obstacles, and of course to cross the finish line. RAME OCEAN offers the skippers ocean rowing logistical support to help them prepare for their solo and crew journeys. 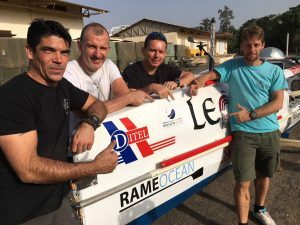 Created in 2012, RAME OCEAN has put on several sailing events, including one in 2012 with a crew of 8, one in 2013 with a couple, and one in 2016 with Patrick Favre (crew of 6). Favre is one of 3 rowers in the world to have crossed the Atlantic more than 5 times by rowing. 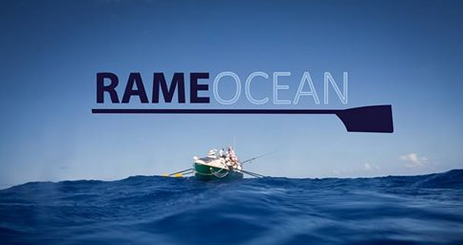 In 2017 and 2019 RAME OCEAN will organize a race to cross the Atlantic Ocean for solo rowers and crews. 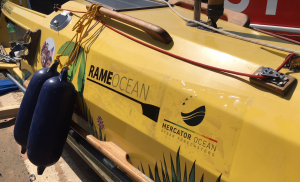 Mercator Ocean supports the initiative of RAME OCEAN and the ORA (Ocean Rowers Association) and provides the organization with ocean current maps in real time. At the home base, the routers receive three daily maps, that of the current and the d + 2 forecasts, to help the rowers determine their routing. The example below shows ocean currents in the Atlantic ocean near Guyana. 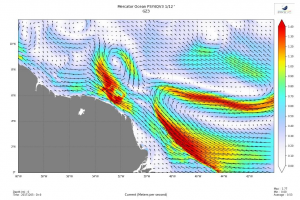 Every day, the Rame Ocean website displays the real-time flow maps. This allows the public to have access to daily information on currents. The maps include currents on a wider geographical area than those used by routers. These are generated with EU Copernicus Marine Service information, meaning that the products made available for RAME OCEAN 2017 come from the Global 1/12 ° operational system produced by Mercator Ocean for the Copernicus Marine Environment Monitoring Service catalogue. Mercator Ocean’s expertise ensures operational service throughout the race for the rowers.